Tony Hey wearing the Blues Shirt (Foto: George Herringshaw, sporting-heroes.net). 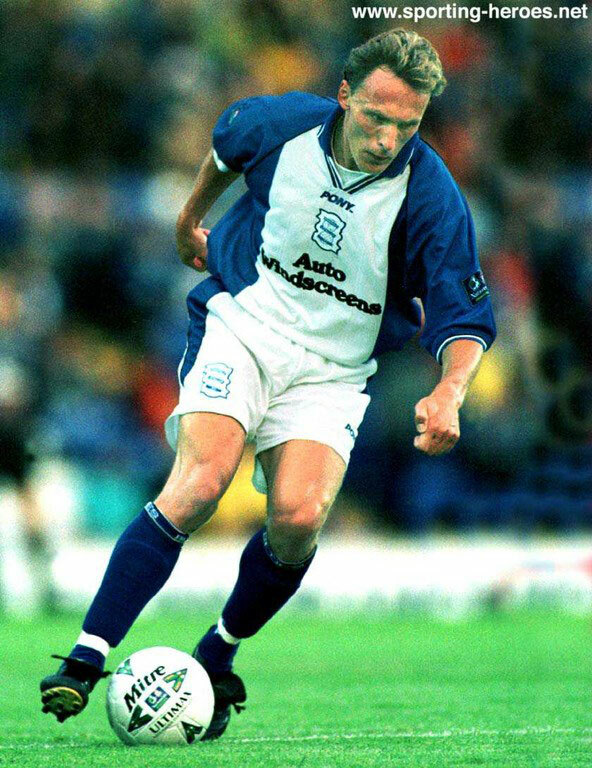 Antoine „Tony“ Hey played for Birmingham City from 1997 until 1999. 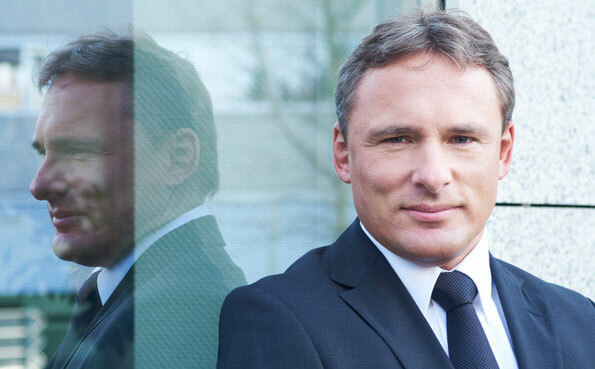 The German player was born in the western part of Berlin in 1970 and made appearences, amongst others, for Fortuna Dusseldorf and Schalke 04 in the German Bundesliga. Finishing his career as a player in 2004, Hey went into coaching. After two engagements with Wuppertal and Munster, the holder of an UEFA-Pro-Licence coached the National teams of Lesotho, Gambia, Liberia und Kenya. On 1 July 2010, Hey signed a four-year contract with the Libyan Football Association appointing him engeneering manager. In an interview with „BiG“, Tony Hey kindly answered Tom Kleine’s questions. With 4 points out of 3 matches Libya dropped out of the Africa Cup in the preliminary round. Can you give us a summary? Under the circumstances, taking part in the tournament was a great success. Qualifying for the finals was a herculean task during this horrible civil war. We are very proud of this qualification. The tournament was just a bonus. All in all we’re very pleased with the team’s performance during the Africa Cup. Were you there yourself on location in Bata, Equatorial Guinea? I had to cancel on short notice because we had to keep some other important appointments. There is a slight lack of organisation at the moment as we’re currently under-staffed at the Libyan Football Association. Therefore we have to join hands and sometimes tackle tasks that are outside our usual responsibilities. In a match against Senegal your team happened to meet Birmingham City’s Guirane N'Daw. What impression did you get of him? Well, he is certainly talented, but so far he didn’t play against us. There surly are more interesting players in Senegal’s squad though. As the manager of the Libyan Football Association, you’ve had a lot of attention in Germany lately. Major media wanted to know why a German citizen is working on football matters in this area of crisis. Has the dust settled a bit around your person? It is sad that I only make it into the headlines because I work for Libya. I’d prefer one would be interested in my work as a football coach, not just the headlines. I’ve refused many inquiries, especially live television appearances. You never know what kind of moronic questions they’ll ask you. What’s the significance of football in Libya at the moment and how do you see the development of Libyan football? Football has a great significance in Libya as well as in Africa in general. We aim to fulfill our social responsibility and help to build bridges across the gulf that has formed within our society. Football has a lot to offer in that respect. First and foremost we will concentrate on finding and supporting young talent. 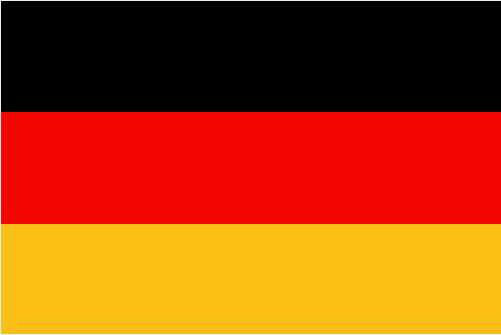 Do you think your boys could make it into the German or English leagues? Sure, there are, as in every other country, talented players in Libya that have the potential to play in Germany or England. Just look at Victor Wanyama of Celtic Glasgow. The boy was eighteen when he made his debut with me and the national team of Kenya. Now he’s playing his part well for Scotland. So, all I can say is: Yes, there are many talented players in Africa waiting to be discovered. What about Birmingham City? Can you recommend the club to your players? Definitely. Even just because of the fanbase and the tradition alone, Birmingham City would be absolute best-address. You kicked for St. Andrew’s from 1997 until 1999. Two seasons mean it can’t have been a bad time? It was a great experience for me. It’s been a childhood dream of mine to play in England professionally. I’m grateful that I was able to do that. Unfortunately, an injury made it impossible to tap my full potential. Why didn’t you stay longer? There was no perspective to get more playing time. That’s why I agreed to resolve the contract. You played under Manager Trevor Francis, the legendary BCFC-player. What was your impression of „TF“? 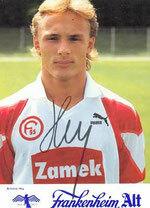 Who were your fellow players at the time and whom do you like best to rember? Steve Bruce, Gary Ablett, Michael Johnson, Andrew Johnson, Martin O‘Connor, Martin Grainger, Ian Bennett. There were many good players, with whom I played in Birmingham. I remember Gary Ablett and Darren Wassall as extraordinarily nice guys. Are you still in touch with your former team colleagues or the club Birmingham City itself? No, but that’s not unusual in the football business. One is temporarily going in the same direction but then you part company again. At first in 1998, a doubtful goal difference regulation ruled out the play-offs and then in 1999 (penalty shootout against Watford in the play-off-semifinal) the Blues missed their promotion into the Premier League by inches. What was the problem? Chris Holland, who missed the crucial penalty (laughs). But seriously, we should have been promoted directly because of our quality. The detour through the play-offs is sheer chance. We weren’t constantly good enough. Trevor with his sometimes strange personnel decisions is largely to blame for that. How great was your joy, personally, when the Blues were eventually promoted in 2002 and last year even won the League Cup final against Arsenal? Birmingham City is a sleeping giant. It stirred slightly but didn’t really wake up yet. I can see enormous potential in the Blues and I’m sure that the really successful years are still ahead of them. Do you still follow any news about the Blues and can the boys make it into Premier League? To be honest just marginally. I sincerely hope for the club and its fans in particular, that they will make it. Birmingham City can do everything. What did you like best about Birmingham as a city? Where were your “hot spots“? I lived in Knowle and therefore mostly stayed in Solihull. I don’t know any “hot spots“ in Birmingham. Anyway, I definitely felt great in England. It was a great time. Did you have any problems with driving on the left, English breakfast and beer without foam on top? No, nothing like that. Everyone was very welcoming and I enjoyed my time in England very much. I would have liked to stay longer. A gentleman doesn’t kiss and tell…. Some things are just not meant to be public. Antoine Hey wearing the jersey of Fortuna Dusseldorf. You as a player and I as a fan of both clubs know: Fortuna Dusseldorf as well as Birmingham City were synonymous for mishaps, missteps and misfortunes for many years. And yet they had a massive fanbase. What’s the element of cult in these clubs? I think, cult develops through communally experiencing success and failure, through emotion. Bayern Munich will never be cult, FC St. Pauli will. In my opinion, clubs that had to face disaster and yet rose up again have more charm and personality than cold, huge, profit oriented corporations. As a fan you have to decide: Do I want to support a club that will very likely be champion? Or perhaps I love to be the underdog that trips up the big ones? Who is the spectators favourite in the boxing ring? The giant that knocks them all out? Or the underdog who has the chance of a life time? Why do so many fans support small clubs in the cup competitions? The uncertainty is a major attraction in sports. Mr. Hey, thank you very much for this interview. My pleasure. Please give my regards to the fans of Birmingham City! In July 2010 Tony Hey signed a four-year-contract as Technical Director of the Libyan Football Federation.